Pictiúir a tharraingt nó a pheinteáil bunaithe ar an téama ‘Tionchar na Gaeilge ar mo shaol/bhaile féin’. Tá an comórtas seo á reáchtáil de bharr maoinithe a chur Comhaire Contae Cheatharlach ar fáil agus tá sé ar oscoilt do bhunscoileanna amháin i gContae Cheatharlach. Físeán ceoil a chur le chéile. Is féidir an fiseán a bhunú ar amhrán nuachumtha nó is féidir focail nua a chumadh agus a chur le hamhrán atá ann cheana. Moltar an méid is mó daoine a bheith páirteach is gur féidir - gach dalta, rang, múinteoir, tuismitheoir a bhfuil ar fáil! Socraigh trealamh le taifead a dhéanamh ar an bhfíseán. Socraigh suíomh le taifead a dhéanamh ar an bhfíseán (roghnaigh áit gheal le dathanna agus cúlra deas). Déan taifead ar an bhfíseán agus déan eagarthóireacht air. Gabh buíochas le gach duine a ghlac páirt ag deireadh an fhíseáin. 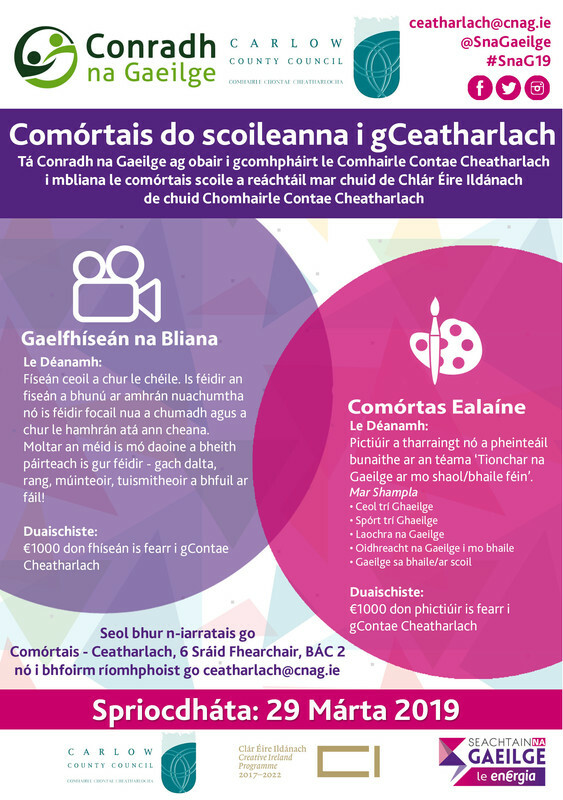 Seol bhur n-iarrtas go Contae Cheatharlach, 6 Sráid Fhearchair, Baile Átha Cliath 2 nó i bhfoirm ríomhphoist go contae@cnag.ie An rud is tábhachtaí – bíodh an-chraic agus spraoi agat agus ag do scoil! 1) Tá na comórtais seo oscáilte d'aon scoil atá sa chontae thuasluaite agus atá san aoisghrúpa cuí (níl cead ag iar-bhunscoil páirt a ghlacadh sa chomórtas ealaíne). 2) Glactar i gcás gach iontráil go dtuigeann agus go gcloíann an iomaitheoir sin leis na téarmaí agus coinníollacha seo. 3) Ní ghlacfar le hiarratas i ndiaidh 23:59 ar an 29 Márta 2019. 4) Is é an chéad duais sa chomórtas ná €1,000 don scoil. Cuirfear é seo ar fáil don scoil le haistriú bainc. 5) Is féidir linn aon iontráil a chuirtear isteach ar an gcomórtas a roinnt ónár meáin shóisialta féin: Twitter, Facebook agus Instagram de chuid Raidió Rí Rá, Seachtain na Gaeilge, PEIG.ie agus Gaeilge24. Chomh maith leis sin, is féidir linn aon iontráil a chur in airde ar na suíomhanna idirlíon seo a leanas: cnag.ie, snag.ie, peig.ie. 6) Roghnóidh coiste moltóireachta neamhspleách na buaiteoirí do na comórtais. Tá an cinneadh deiridh ag an gcoiste. Ní bheidh chomhfhreagas againn maidir leis an gcinneadh seo. 7) Fógrófar na buaiteoirí go poiblí ar an Luan an 22 Aibreán 2019 ag 13:00 ar na meáin shóisialta de chuid Chonradh na Gaeilge (Facebook, Instagram agus Twitter). Cuirfear teachtaireachtaí príomháideacha chuig múinteoirí sna scoileanna sin ar an ríomhphost freisin. 8) Munar fhéidir le foireann Chonradh na Gaeilge teagmháil a dhéanamh leis na buaiteoirí taobh istigh den chéad sheachtain, roghnófar buaiteoir eile. To Do: Draw or paint a picture based on the theme ‘Gaeilge: The influence it has on my life/in my area’. To Do: Put together a music video as Gaeilge using an original composition or putting new lyrics as Gaeilge to a well-known song. This creative competition is a project the whole school can get behind. Get as many people involved as possible - every student, class, teacher and parent available! Watch the sample videos below for inspiration. Thank everyone that took part at the end of the video . The most important thing – make sure you and your school have a great time! Support: If you need help with this project, we reccommend that you contact Clár TechSpace by emailing info@techspace.ie or email pol@cnag.ie directly. 2) All entries are accepted from the competitors with the understanding that they comply with these terms and conditions. 3) An application will not be accepted after 23:59 on 29 March 2019. 4) The first prize in each competition is €1,000 for the school. This will be made available to the school via bank transfer. 6) An independent judging panel will select the winners of the competitions. This panel will have the final decision. We will not have correspondence regarding this decision. 7) The winners will be announced publicly on Monday 22 April 2019 at 13:00 on the social media platforms of Conradh na Gaeilge (Facebook, Instagram and Twitter). Messages to teachers in these schools will also be sent by email. 8) If the Conradh na Gaeilge team cannot make contact with winners within the first week, another winner will be selected.